Hiking is definitely one of things that I love to do (but definitely hate myself when we're hiking, at times!) here in Vancouver. My sister told me about the Sea to Summit trail, which was a shorter hike than the Chief trails, which we were planning on hiking. The best part is, that you can take a nice gondola back down... perfect! After doing the Garibaldi hike last year (I realized I haven't blogged about that, yet!) I've kind of dreaded going downhill. Well, the Sea to Summit trail is an intermediate trail. I've been pretty busy working around the clock lately, I know I'm definitely not as fit as I used to be! It's a 7.5 km hike + 1 km if you're coming in from the Shannon Falls parking lot. My sister and I started early and parked at the Shannon Falls Parking Lot. We read from other blogs that the Sea to Summit Parking lot was only for 3 hours. The Shannon Falls Parking Lot is just off the Highway 99 close to Squamish. You'll see signs to the Shannon Falls, and a traffic light, where you will turn right if you're coming from Vancouver. Since we were really early (730am) there was practically no one in the lot. There are picnic tables and washrooms there too, which you may want to visit before you head to the hike. To the right of the washrooms you'll notice signs to the Shannon Falls. We passed by and took a few photos of this majestic falls, apparently the third highest in BC. Saw this super cool slug on the way to the junction! Then you'll keep heading left as you'll see signs to the Stawamus Chief trail, follow that as it'll lead you to the junction point for the Sea to Summit Trail. You'll then turn right and up the Sea to Summit trail. You'll start seeing these light green diamond trail signs with counts from 12 (I think, since we came from Shannon Falls) up until 399. I recommend to stop counting. Haha! The first 1.5-2 km of the hike was definitely challenging for someone who hasn't hiked for a while. Lots of uphill and large steps, without break! My sister and I enjoyed it though as it was had a variety of uphills, instead of a paved path. It had lots of rocks, some steps, logs and trees to hold onto. Then, the few km's have some challenging parts but it definitely is more flat/easier overall. We really loved the scenery throughout the hike, the interesting trees and plants. 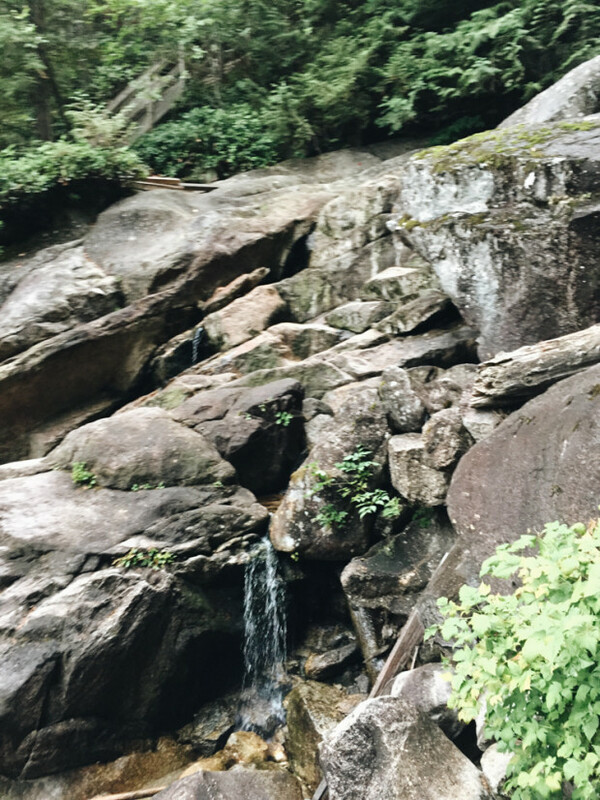 Plus, you'll end up seeing the Upper Shannon Falls section, which is just incredible. The cliffs and the rocks and the amazingly clear water is just breathtaking. Makes you think we're not on a drought. The last 2km's were a little challenging as well as we were getting pretty tired going uphill. Our legs were getting heavy and sore! But the best part of hiking together is cheering each other on. There were some really exciting parts like fixed rope chains, going up rocks and some steep inclines. We even got a little lost, but we quickly found our way back. Seriously, the last few sign numbers (from 375 to 399) seemed so far apart! Or we were just tired. But we got a glimpse of the gondolas and we could hear it running, so we were ecstatic that our goal was really close. Around 10:45 am we made it to the summit! So around 3 hours 15 mins from the Shannon Falls parking lot. Since it was quite a foggy day we didn't see a ton of view, but it was great going early because we saw a total of 4 people in the entire hike. It was also great that it wasn't hot, because going uphill can definitely get your heart rate and body temperature up! At the summit, there was the hanging bridge and a number of junctions for additional trails as well to head to, but since it was so foggy, we knew we wouldn't see much. Next time, perhaps! We really loved the hike. Then, you can get a ride down the gondola (it's $10 only vs. $40 for a roundtrip). Overall, a fantastic hike! Definitely not for the fainthearted. Would definitely recommend it! Wear the right shoes. The terrain varies throughout the hike, some climbing involved, and it can get slippery, especially since it was drizzling when we went. Bring some snacks and water. There wouldn't be any until you're at the very top! Go early. Especially when you like going your own pace, it's fantastic to be hiking when there's not a lot of people on the trail.